Sitemaps allow website owners to inform search engines what pages on their website are available for crawling. The protocol was set up to help search engines crawl your website more intelligently. It was first introduced by Google in 2005, with MSN and Yahoo offering their support to the protocol a year later. Sitemaps are known as URL inclusion protocols as they advise search engines what to crawl. On the other hand, the robots.txt file is known as an exclusion protocol as it advises search engines what not to crawl. In its simplest form, a sitemap is a document that lists all URLs of your website (that you want crawled). The document details additional information such as the date a page was last modified, how frequently a page may change and whether the page should be given priority over others. Specific sitemaps can be created for each type of content. For example, one sitemaps for blog posts, another for videos etc. The importance of Sitemaps should not be downplayed. They help search engines navigate your website more easily, which helps search engines index your content better. If you think of your website as a building, the sitemap is a blueprint that informs search engines exactly where everything is located. Do not worry. You do not need to manually enter every single URL from your website in order to create your sitemap. Sitemaps can be automatically generated. For a small static website that does not have content added frequently, I recommend using a sitemap generator such as XML-Sitemaps. It allows you to define how often your pages are updated and what modified date is used. XML-Sitemaps is a quick way of generating a sitemap for a static website. Once the generator has created your sitemap, you need to upload it to the root of your domain e.g. www.yourwebsite.com/sitemap.xml. The XML-Sitemaps generator is limited in many ways. Firstly, it has a limit of five hundred pages. Secondly, it defines the same “change frequency” for all URL’s. This is obviously not suitable for any website that publishes content every week as you want your home page spidered more frequently than other pages. 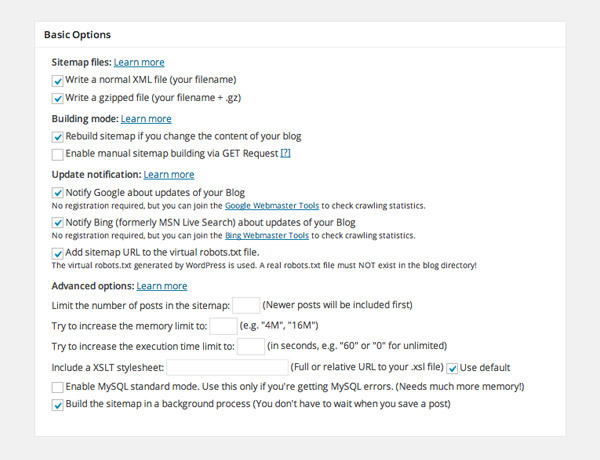 There is an abundance of sitemap plugins available for WordPress. Options include XML & Google News Sitemaps, Better WordPress Google XML Sitemaps and Google Sitemap. 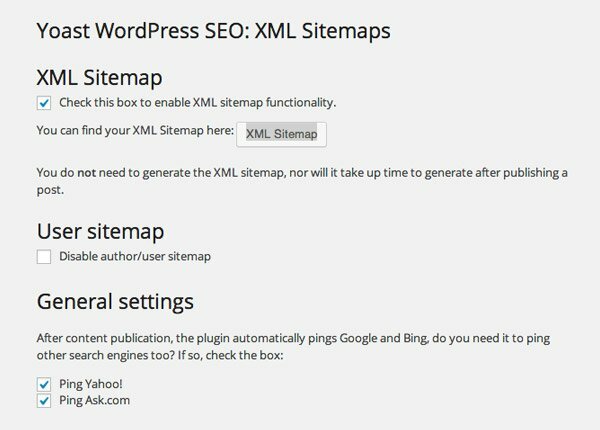 I would personally recommend one of two plugins for creating a sitemap for your WordPress website. 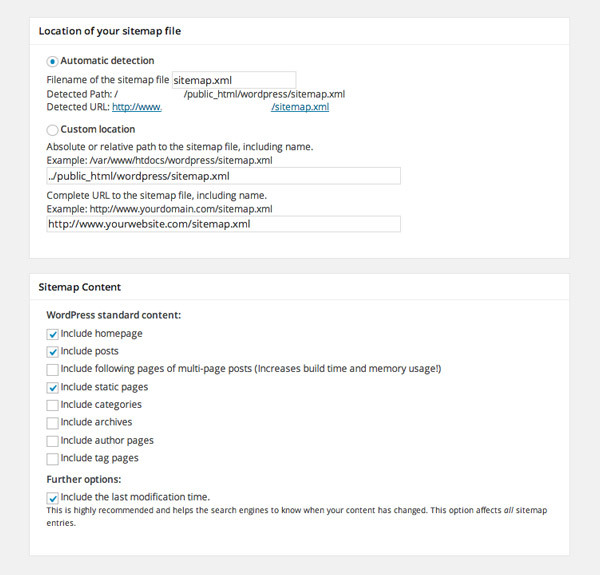 If you are already using the fantastic WordPress SEO by Yoast plugin, I recommend using the sitemap generator that is built into the plugin. If not, I recommend using Google XML Sitemaps. WordPress SEO by Yoast is what I am currently using on my personal blog. I use it to create sitemaps for my blog because (a) I use the plugin for SEO already, and (b) It is very simple to set up. The majority of people will not need to change any settings in the sitemap settings area. Options such a sitemap for users and pinging Yahoo and Ask.com are already enabled, but can be disabled if necessary. WordPress SEO by Yoast offers a sitemap interface that is easy to configure. Specific post types and taxonomies can also be excluded from your sitemap. The number of URL’s listed on a sitemap page can also be limited so that less strain is put on your server. 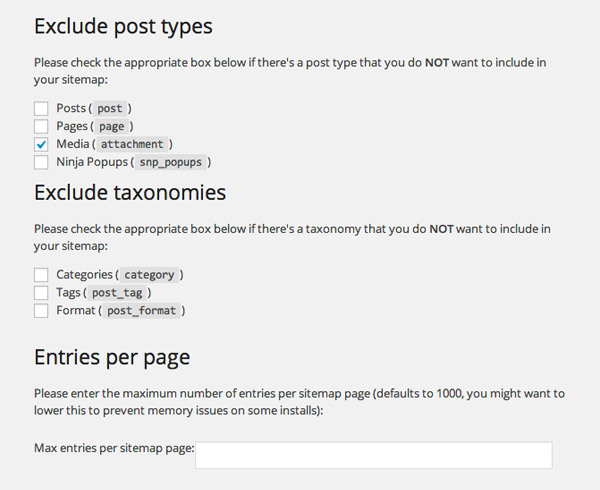 The plugin allows you to exclude specific post types and taxonomies. Your sitemap will be generated and published at http://www.yourwebsite.com/sitemap_index.xml. The main sitemap page lists a sitemap for each post type. The main sitemap lists all of the different types of sitemaps that are available. Each sitemap lists the URL’s that should be be crawled. Their priority, number of images, change frequency and last modification date are all displayed. The information can be displayed in a different order by clicking on one of the table headers. Each sitemap lists the URL’s that should be crawled. Google XML Sitemaps is a better option if want more control over your sitemap. At the top of the plugin settings page, it details when your sitemap was last generated. It also lets you know how long it took to build the sitemap and how much memory it used to do so. Many configuration settings can be modified through the main settings page. 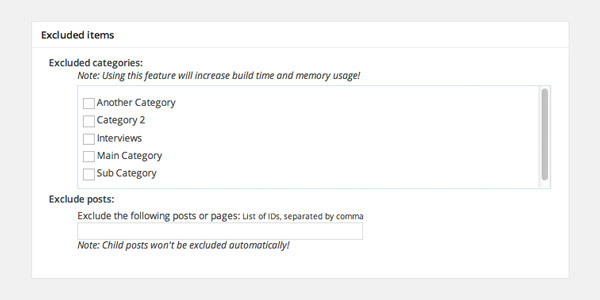 In addition to limiting the number of posts that are listed, you can increase the memory limit and execution time for the sitemap creation process. Google XML Sitemaps offers a huge amount of configuration options. Google XML Sitemaps also allows you to define pages that were not created through your WordPress website. 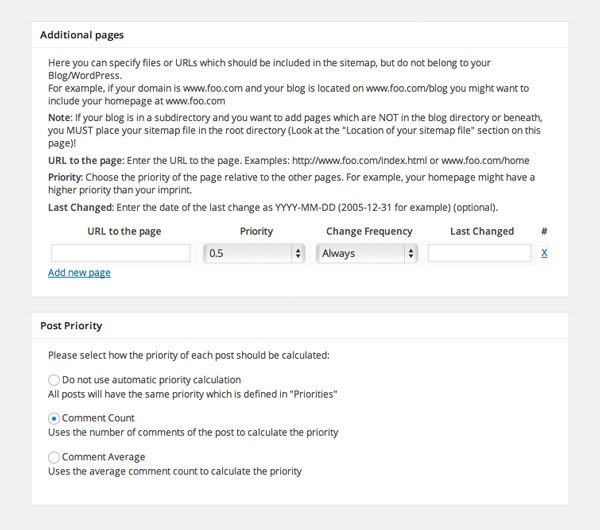 There is also an option to define the priority of posts based on the number of comments they have. Additional pages can also be defined in Google XML Sitemaps. Your sitemap will be automatically generated and published at http://www.yourwebsite.com/sitemap.xml; however this location can be changed in the settings area. 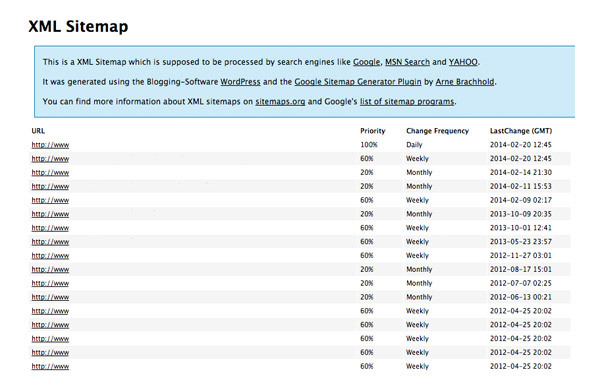 Google XML Sitemaps also allows you to define what areas of your website will be listed in your sitemap. The plugin allows you to exclude many areas of your website. Specific posts, pages and categories can also be excluded. You simply need to enter the post or page ID. In addition to post types, Google XML Sitemaps lets you exclude posts, pages and categories. The change frequency and priority can be changed for eight different areas of your website including your home page, posts and archives. In my opinion, the default configuration is fine, though you may want to change it for specific areas of your website. 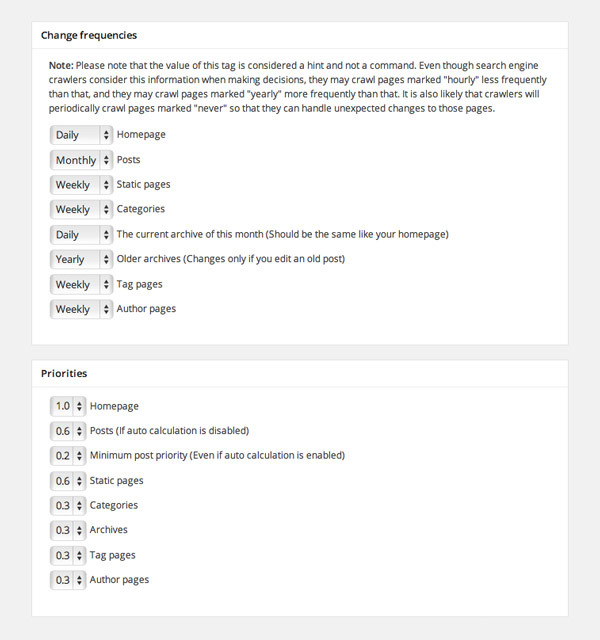 The plugin allows you to specify the frequency and priority of every type of page on your website. Unlike WordPress SEO by Yoast, the plugin does not create separate sitemaps for each post type. The number of images on each page are not listed either. All URL’s are listed on one page. Once your sitemap has been generated, you should submit it to Google and Bing. You can do this via Google Webmaster Tools and Bing Webmaster Tools. Search engines should automatically detect sitemaps that are placed in the root of your domain. There is, however, a benefit to submitting your sitemaps directly to Google and Bing: Analytics. Webmaster Tools allows you to see exactly how many pages and images have been submitted and indexed. It will also highlight any errors that you may be unaware of. Submitting your sitemap to Webmaster Tools will let you see exactly what URL’s have been submitted and indexed. If you have not created a sitemap for your website, I encourage you to do so as soon as you can. It will have a positive effect on your search engine rankings by giving search engines a better understanding of how to navigate your content. Excellent. very good contribution. especially for those who are new to it, like me. It’s really very useful information. I use WordPress SEO by Yoast in all my WP blogs and for me is a must have. Great post. I use Yoast’s SEO but didn’t like his sitemap generator for some reason. Can’t remember now why. I’ll have to have another look at it. I do like submitting it myself with Google’s Webmaster Tools, but I think that’s just an insecurity issue. Once I do it myself I know it really got there. Hy, thanks a lot for these useful informations. Sorry about that. I fixed the link. Not related with the content of this post but what nice social left bar are you using? We are using AddThis Pro. @Julius – I’m not sure what was wrong with the link, though looks like Nick has beat me to the punch and fixed it for me. Thanks for letting us know. I just wanted to thank Elegant Themes for this blog. The articles are frequent and consistently interesting and informative. I’ve learned so much about WordPress since I subscribed. I find it incredibly valuable. Thanks Kevin! This was very helpful. I too love the Yoast WordPress SEO plugin – it’s awesome. It makes things easy that would normally be pretty complicated, including the sitemap function – which I actually discovered just last week. I ran my first sitemap and saw quite clearly that insignificant pages were getting the same priority as the most important ones. You just click the link on the site map, change the priority for that page in the Yoast settings, and voila, it’s fixed. It also made me realize that there were some pages that I should actually no index, which the plugin does for you as well. I wasn’t sure if there was anything more or different I should be doing, and your article totally covered that – I’m all set! Great! for SEO of my wordpress ! Thanksss…! 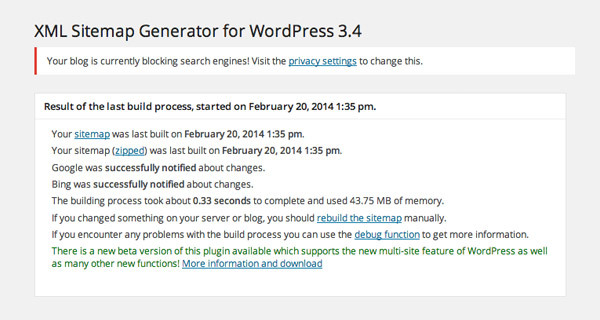 Very Good Article Nick, Step by step complete sitemap setting in WordPress. Such a valuable information. Thanks for share !!! Can we use Yoast sitemap and Google XML Sitemaps plugin to gather ? You can enable both sitemaps, though I am not sure why you would do so. There certainly wouldn’t be any benefit to doing this as both sitemaps would show the same links. Therefore, it is better to just choose one or the other. What an excellent article! What an excellent outfit Elegant Themes with their daily blog, just incredible. I do not know how they can keep up with this pace and quality. Elegant Themes is going to be too popular and that is perhaps a danger for current users, but let’s enjoy it in the meantime! When support becomes a bit more streamlined we may have the best in business in the form of Elegant Themes! Thanks for the great article – very helpful! We have a multisite setup to realize different language versions of our site like example.com and example.com/en/. Do I have to generate a sitemap on both sites? Go on with the good work! Apparently it does work with multsite (though I have never used it myself). Great post and comparison. Thanks, Kevin. And thanks, Elegant Themes. 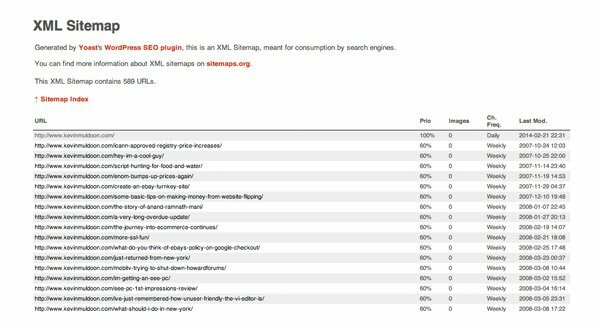 i have one question about this, Google XML sitemaps plugin auto post you your sitemap or after this you will be upload this sitemap to google webmaster manually? It should detect it automatically, though there is no harm in submitting it via Google Webmaster Tools so that you can monitor the indexed pages. Do you have to resubmit your sitemap to Google Webmaster Tools, or will it automatically update? Hi Kevin, Thanks for the article. It’s very informative. I just have 1 question: if sitemap generator such as XML-Sitemaps are limited. What do you suggest we use? Or how to go about generating sitemaps that are not so limited? Thank you sir for providing nice and useful information. I have one question related to sitemap. Can i have both sitemap such as web sitemap and google news sitemap in one website. thank you for this great post. i have a question, i named and published all the pages for my website but i still didn’t finish entering the content of these pages. will it make any difference if i did the sitemap now or if i did it after entering the content to the pages? This is a very helpful post. I noticed that on my Webmaster Tools, only web pages (not images) are listed. Does this mean that my images are not being “crawled” by Google? I have a WordPress site (single page) on the root domain and another WordPress site on a subfolder for my blog. The single page on the root domain does not link to the blog in the subfolder, nor do I want it to. The question is, should I have 2 site maps, one in the root folder and one in the blog subfolder? If I only need one in the root domain, how do I go about making sure that the blog subfolder is included in the root sitemap? And should I have both the root URL and the blog subfolder URL showing separately in Google Webmaster tools? Would appreciate some input on this as I’m really confused. Thanks! Thank you for this great post above…I noticed that your Yoast site map image above (seo-sitemap-2.jpg) has ‘Daily’ set as it’s ‘Ch. Frequency’. Do you know how to set this as my Pro version of Yoast appears to be default to weekly and I can’t figure how to change it and haven’t heard back from Yoast. Great post for beginners like me. I appreciate that you wrote this, it both cleared things up for me and made me send my sitemap to Google. Hopefully I will see results soon. According to me WordPress SEO Plugin best 🙂 no need other plugin for onpage seo and google sitemaps.Thanks for your valuable information. Thanks for the post, it helped a lot. The big question I’m having now is “is it OK to have two separate sitemaps for one website?” here is the problem. I have a website on the root domain “www.website.com” that is not built in WordPress and has a sitemap that is generated from Open Cart. Then I have a WordPress blog installed on “www.website.com/blog”. I can not find a way to integrate both sitemaps as they are two completely different platforms. Is it ok to have both “www.website.com/sitemap.xml” and “www.website.com/blog/sitemap.xml” and submit both to Google? Yes, it is okay to do this because Google will treat each sitemap as if they were independent of each other. Think of the sitemap as a giant collection of links to your content. There should be no problem with having two different sitemaps. One of my websites has i believe 15 or so. Great information, i’ve got some problem with yoast xml, webmaster says my sitemap generate by yoast is having error so i turn it off and use bwp google sitemap. If the sitemap is submitted to a wordpress blog, does it automatically update when a new post is made on the blog? Or do we have to update the sitemap manually every time we create a new post? Thanks a lot…Do you have any tutorial to make sitemap use php?.. I agree sitemaps are crucial to any website no matter the size of it. I use to use the xml-sitemaps.com website until WordPress became popular and I switched to Yoasts plugin WordPress SEO. I use video sitemaps as well, if you havent done sitemaps for videos you should consider that. Hello, I appreciate that this post and comments are a year old and is WP specific, but for anyone new coming to it after mid 2015 the following link might be useful. It details a reply from Google on the question of importance of priority and change frequency in XML sitemaps submitted to Google. The answer is basically, none. The time stamp is more important. If the link is deleted then do a G search for; “how to set the change frequency in xml site maps”, the link should be close to the top. Good luck. I’m using last version of Divi and Yoast Seo together, I’m in a trouble because Yoast doesn’t generate sitemap. When i click sitemap button next page show me that don’t found results. Hi. I am new to blogging. I am submitting my sitemap daily. is there any problem? 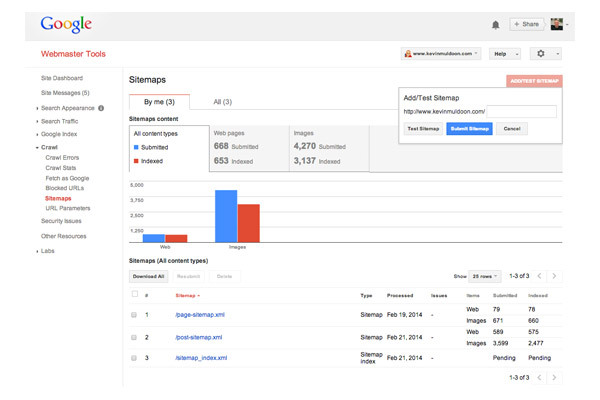 Should you include your archives in your SiteMap? If I use wordpress on multisite and want to use the manual method of generation XML maps and uploading them to the directory, how would I upload three xml files under the same name to the directory because if I am running one main domain and two subdomains this would be the case. Very informative article. I am new to XML sitemaps and realized I currently have Yoast SEO and Google XML Sitemap plugin running on my WordPress website. Is there any issue with using both?